India has an inspiring growth story. In a time when most developed economies are still reeling under the worst recession in decades, India is surprisingly untouched and has emerged resilient by posting commendable economic growth rates of over 6.5 percent in the FY 2008- 2009. This is even more remarkable when we consider the unprecedented floods the nation had to deal with in the same year. India posted a near stellar 7.9 percent growth in the second quarter of fiscal year 2009-10, with the manufacturing sector clocking an even more impressive 9.2 percent. There are several underlying assets that kept India strong during this period: a large domestic market, and a strong industrial base, including SMEs, and relatively speaking, less dependency on an export-oriented market. These factors, together with a large potential demographic dividend, natural resources, and a well-functioning market economy, continue to give strength. India’s incredible growth story, however, not only amazes, it confounds. With so much going for it, it still ranks very poorly on many global dimensions. For instance, on the Human Development Index, it ranks 132 out of 179 countries; on the Transparency Index, it ranks 85 out of 180 countries, on the Prosperity Index, 70 out of 104; on the Education Index, 142 out of 176, and on the Global Hunger Index, an embarrassing 66 out of 88. With high overall GDP growth existing concurrently with poor performance on many metrics, India has graduated to a new problem: growing economic disparity. A holistic and well-thought out approach to developing India’s SME sector is the most effective approach to addressing disparity. Weak employment and employability, i.e., the need to create gainful employment for hundreds of millions entering into the job market in the coming decade. Efforts by the Indian government to increase the gross enrollment ratio to 30 percent (still lower than the 40 percent for developed nations) from today’s ratio of about 11 percent, alone adds an additional 70 million with higher education looking for employment by the year 2020. Micro solutions chasing mega problems, i.e., the lack of scale and multiplier effect to current approaches relevant in the Indian context. Creating socio-economic equity within a high-growth environment is the pivotal challenge of the country in this fresh new decade. It will be key to guaranteeing economic security with growth, access to affordable health care, education and clean environment to all its citizens. Without socio-economic equity, India’s hard fought successes will largely evaporate, and be replaced irreversibly with an entrenched, calcified system of stark disparities. The solution to India’s challenges lies in reframing the question on poverty: from eliminating poverty to fostering the creation of wealth by many across the nation. A holistic and well-thought out approach to developing India’s SME sector is the most effective approach to addressing disparity. Thus far, Indian SMEs have played a very significant role in India achieving its current robust overall economic growth. The SME sector currently contributes to over 40 percent of exports, and creates over 1.3 million jobs per year. About 60 million are employed in this sector. In addition, SMEs enhance inclusive growth by the manner in which they evolve, leverage local resources, and innovate to create products and services. A well-thought out SME-driven entrepreneurial ecosystem can take the industry and India, to the next level. In order to address this growing economic disparity, Indian SMEs will have to play a far more significant role in the future, both in terms of employment generation as well as contribution to India’s overall GDP and exports. In advanced economies, like the US, entrepreneurial enterprises account for a large portion of new growth. In a study conducted by the US-based Kauffman Foundation in 2009, one-third of the over $14 trillion US economy came from new enterprises that were created within the last 25 years. Achieving a similar benchmark is far more critical for India. It is also very much possible, if India takes a holistic and pragmatic approach to creating new enterprises, while supporting the growth of the existing SME base. India is aspiring to grow its economy by 9 percent or more over the next decade. 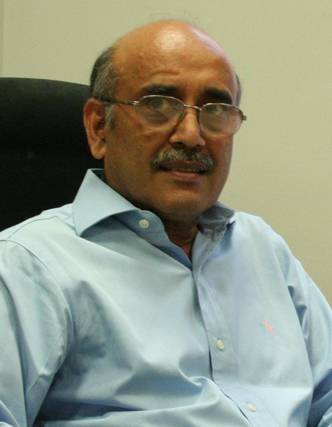 To achieve this level of overall GDP growth, assuming a steady growth of 2.5 percent and 8 percent in the agriculture and services/manufacturing sectors respectively, the SME sector (both existing and new enterprises) would need to quadruple its GDP contribution from the current level of $200 billion. This would mean that both existing and newly created enterprises could contribute as much as 28 percent of India’s GDP by the year 2020, when the overall economy is expected to reach USD 2.8 trillions from the current base of USD 1.2 trillion in FY 2008-09. India can achieve its socio-economic objectives by focusing on gainful employment for millions of educated youth and by helping millions of others transition from an overburdened agricultural sector to the small-scale manufacturing and service sectors in the next decade. A strategic and holistic approach of encouraging entrepreneurship can tap into India’s entrepreneurial gene and redirect a few million of the job seekers into jobs creators. Nationwide entrepreneurship development with the appropriate scale, scope and relevance can catapult India into the higher orbits of socio-economic prosperity. What are the key steps that would help both existing SMEs and new startups contribute their share of over 28 percent to the overall socio- economic growth of India in the coming decade? 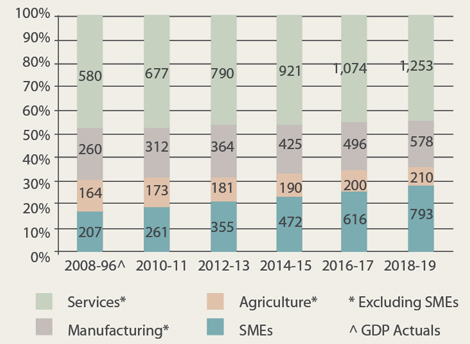 Previous SME revitalisation efforts have offered broad-based micro and SME (MSME) support in the shape of government-initiated financial incentives and schemes. The MSME Act of 2005 is one concrete example. These initiatives have had only a diffused impact on the sector. However, with a sharpened focus on sustainable enterprise creation and growth of existing SME base leveraging local resources, the Government of India can think beyond short-term financial infusions and simplified administrative measures. In order to accomplish this, the nation must focus on creating a facilitative and pragmatic policy framework. To be sure, this required framework must provide clarity on providing timely credit flows. However, a larger effort will be on technology development and up-gradation, technical skills development in the labour force, taxation, labour reforms, establishing transparent ratings and governance, and the revival of sick industries. The government efforts should also focus on ensuring geographic spread of employment generation and gainful employment across the nation. This would maximise socio-economic value, and mitigate regional imbalances and ultimately, migration to urban areas, thus attacking two of the major problems of economic disparity outlined above. The SME revitalisation strategy must also focus on all phases of SME life-cycles, from startup, scale-up, and turnarounds as well as growth. India is leveraging the inherent entrepreneurial culture of its people through the adoption of modern entrepreneurship models. Despite this growing awareness, new ventures creation activity is still too low. The result is islands of success disconnected in an ocean of opportunities and scope. For example, the context of entrepreneurship development in India is different from the context that drives entrepreneurship in the Silicon Valley. This may be why adoption of Silicon Valley models leads to limited success in India. Transformational entrepreneurship goes beyond the traditional start-up company’s focus on financing resources. Instead, it concentrates on addressing the core mega-challenges facing the nation, with the appropriate scale, relevance and innovation. To address these challenges, India needs to evolve its own framework for entrepreneurship within a nationwide ecosystem. The development of such an ecosystem requires innovation through public-private partnerships, and collaborative models of engagement between government, educational and training institutions, financial institutions and the industry. Such a framework that embraces collaborative value chains also needs business labs to design and test sustainable and inclusive business models supported by indigenous and appropriate technologies. It needs communities of collaborative enterprises, as well as sustainable business value enabling policies and regulations. An example application would be to establish a better fiscal incentive and subsidy regime to help build capabilities, productive assets and competencies. Innovation under local conditions is another critical element to help SMEs, both new and existing, address India’s mega challenges. First and foremost, any innovation must think about the concept of scale in the Indian context, the target customer size, reach, price points, and how to leverage local resources, given all attendant cultural and regional sensitivities. To address this, India needs to develop its own indigenous models to make them pervasive. It cannot simply emulate established models from elsewhere. India needs to reassess the applicability of these models in the Indian context. Global multinational corporations have already understood India’s ability to be a unique laboratory for global innovations. A recent interview with the GE CEO Jeff Immelt discussed the concept of “reverse innovation”, where products innovated locally in India will be adapted and taken to scale in more developed markets, instead of the reverse, as has been traditionally the case. A similar approach can be used in entrepreneurship as well. A perfect prototype to accomplish the stated social equity goals is to redefine the concept of SEZs. Usually this acronym stands for Special Economic Zones, demarcated areas with economic laws more liberal than the country’s typical economic laws, in order to increase foreign direct investment, exports and stimulate economic growth within that area. Under the new vision of building social equity, they can be redefined as a network of coordinated Social Equity Zones and Special Employability Zones, spread across the country at village, mandal and district levels, covering all 625 districts nationwide and linked with various industry clusters. These new zones will be primarily focused on sustainable social-economic development aligned with local resources and needs but with global aspirations. From standpoint of their execution, these zones will concentrate on building productive assets with a focus on sustainable skills enhancement to support micro and SME enterprises. While the physical size of these zones will vary from a few hundred to several thousands of acres, they will all follow the same basic model. This model will focus on economic growth and employability, coupled with environmental sustainability and social viability driving their development. To accomplish these objectives, a set of transformational initiatives along several dimensions are needed. These initiatives would focus on defining and establishing an alignment between social vision and economic vision driven by political vision. Social vision focuses on people; the economic vision focuses on achieving social equity while the political vision focuses on simplified but detailed governance at multiple levels. The focus must be on inclusiveness, accountability, partnerships, local governance, and transparency. A holistic and integrated focus on building a nationwide entrepreneurial ecosystem can reshape India’s socio-economic landscape in the next decade, and enhance its global standing enormously in all socio-economic dimensions of growth. Nation-wide entrepreneurship development with appropriate scale, scope and innovation will make all the difference.